This week we’re taking a closer look at the five main edeinos clans detailed in the Living Land sourcebook. Because of the low Social Axiom, edeinos organize into small groups called tribes. Tribes can number just a few dozen or up to a thousand. Related tribes are loosely associated in the form of clans, and upwards of hundreds of tribes make up a clan. Each clan can be found in a general area in the Living Land, although this doesn’t mean that isolated tribes can be found in other locations as well. Each tribe is led by a chief, and each clan has a chieftain and a champion. The Bluespine Clan, who color their hide turquoise and bright blue, is found in Florida and Cuba, and is rather insular compared to other edeinos clans. According to legend, they were driven off the land by the other clans and have now adapted to living in the water. They have webbed fingers and lungs that can allow them to remain underwater for hours. Baruk Kaah uses Bluespine edeinos to place and guard deep water stelae. The Ghost Clan is mysterious and highly territorial. They are located up and down the west coast from California to British Columbia. These edeinos are almost ephemeral, using leather dyed white and gray to camouflage themselves in the Deep Mist, which is more prevalent in the Western Land. Additionally, these edeinos have a strong connection with local dinosaurs. Ghost Clan edeinos can often be found in Wonders dotting their territory, and have a greater fascination with the trinkets and technology found in these locations. The Delphi Council has marked the Goldsun Clan as possible allies against Baruk Kaah, and are located on the Yucatan peninsula in Mexico. Goldsun members enjoy adorning themselves with gold and jewelry. The Redjaws are Kaah’s clan, and he is not only the Saar of Saars but is the chieftain of his clan. They’re located mostly in the eastern United States, with concentrations around New York and Georgia. Baruk Kaah maintains his command over the Redjaws by leveraging Lanala. He claims to speak for her, and every attack the Redjaws make is holy. Located in the upper Midwest, especially around the ruined cities of Detroit and Chicago, these edeinos are turning their backs on Lanala, and instead follow Rek Stalek, the god of their chieftain, Thrakmoss. 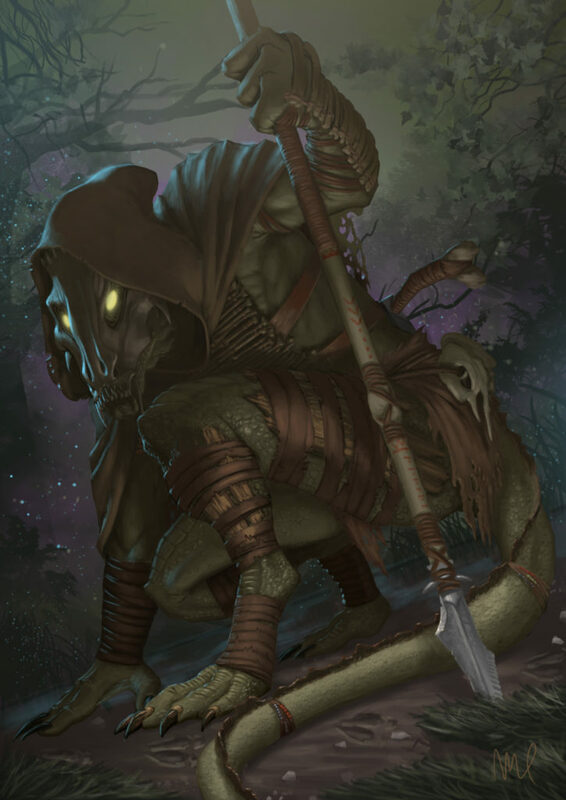 They typically use sharpened dinosaur bones as weapons, rather than hrockt roots, and fight alongside undead dinosaurs. Whitespears are extremely loyal to Thrakmoss and those who disagree with his rule often find themselves killed and raised as undead. If they will not be loyal alive, they will be loyal dead. 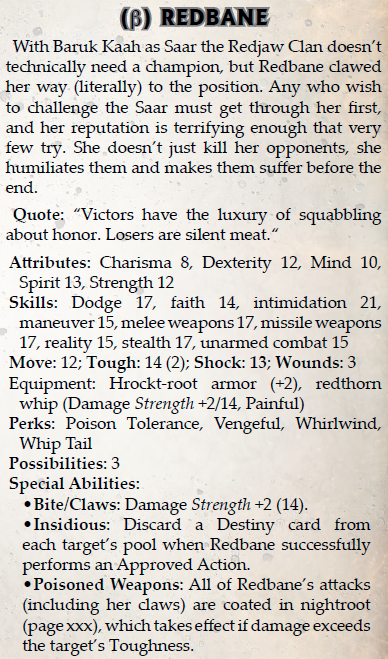 The champions of each clan are detailed in the Threats section of the book. We have already posted information for Spearhand, the champion of the Whitespear Clan, so here is Redbane, Baruk Kaah’s own champion! This is something that the original needed. The best part of Nile Empire (possibly all the Realmbooks) was the section on the Overgovernors and other top villains. Since I’m still running the old version, I will definitely be borrowing this. Even as I’m anxiously waiting to buy the new books. I have concerns about the systems, but the setting information sounds amazing.